WW1 Reenactments Equipment : Great War Tommy WW1 Documents, Paperwork : Leave Documents. 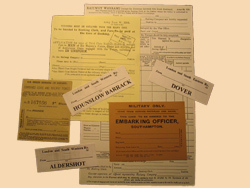 WW1 Reproductions and WW1 Reenactors Equipment / Kit - Leave Documents. The good news -everything you need to get back from Flanders! Railway Voucher, Combined Leave and Railway Journey Ticket, Vermin-free "Chat" chit, Embarkation docket and Labels. The bad news - everything you need to get back to the front!